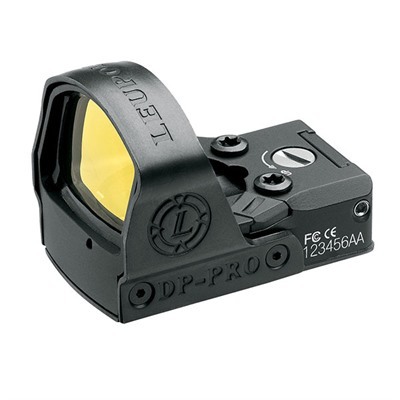 Leupold's highly versatile DeltaPoint™ Pro reflex sight is equally effective when mounted on a handgun, shotgun, or tactical rifle. Gives classic intuitive red dot targeting that helps master marksmen and novice shooters alike hit the target with speed and precision. Lightweight aluminum housing is shrouded by spring steel for maximum shock resistance. Non-magnifying aspheric lens gives a wide field-of-view with superb image quality, while Leupold’s Motion Sensor Technology™ immediately detects any movement of the sight and turns it on - no need to fumble with switches. Auto-Brightness sensor immediately adjusts optimal reticle intensity, yet can be overridden if you want manual control. For tactical situations, the built-in light tunnel reduces the light signature caused by the reticle. Tool-less entry to battery compartment makes changing the batteries easy. 60 MOA elevation/windage adjustment in 1 MOA increments, with no need for adjustment lock screws. Includes battery, and protective cover.